On global standards, IATA sees this, along with best practices, as key to sustaining safety improvements, with Mr. de Juniac pointing out that over the last five years, the accident rate for airlines on the IOSA registry has been nearly three times better than for non-IOSA airlines. 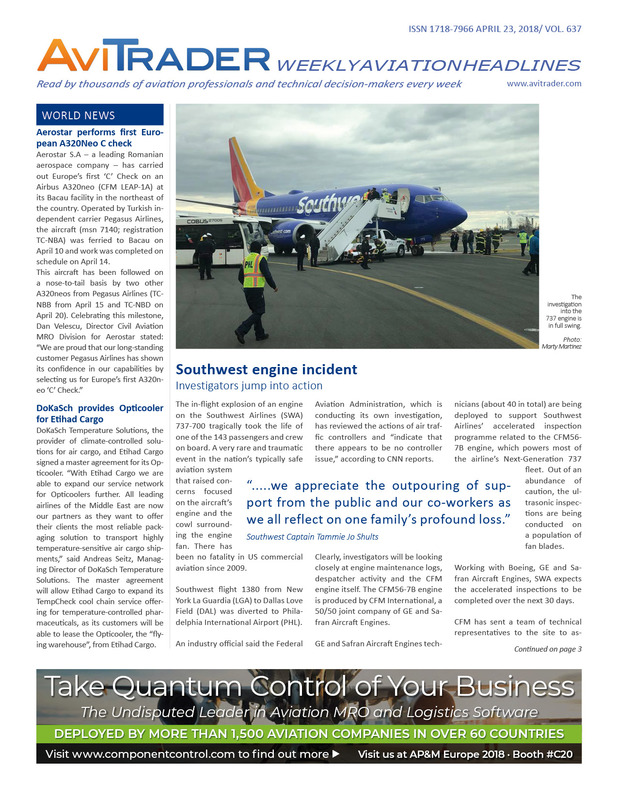 Shortly after Mr. de Juniac delivered his remarks to the Safety and Flight Operations Conference, the industry suffered a fatal accident with WN1380. Mr. de Juniac commented, "This accident is a tragic reminder that our work on safety is never done. Accidents are extremely rare. Our goal is to eliminate them." Philippine Airlines (PAL) has selected Airbus Flight Hour Services (FHS) to support the maintenance requirements of the Philippine flag carrier’s A350-900 aircraft with the signing of an FHS-Components Maintenance contract, the first comprehensive maintenance solution in the Asia-Pacific region exclusive to PAL’s fleet of six A350-900s. The Airbus FHS, powered by Skywise, provides the highest reliability for operators of the A350 XWB. Under the agreement, Airbus will handle component services, repair, warehousing and transportation for PAL, supported by Airbus FHS pools in Hong Kong. It will allow for a proactive component engineering, with strong engineering focus that enables operators to predict in-service issues. This will lead to an improvement in operations by reducing delays, and help to simplify troubleshooting. The Airbus FHS will be strengthened by Airbus’ data platform Skywise, taking advantage of state-of-the-art data hosting and analytics to optimise the airline fleet utilisation. This new service will harness ‘big data’ to greatly enhance levels of operational performance, compared with current industry technologies. PAL will receive the first of six A350-900s in July 2018. The FHS contract will support the airline in its operations to New York and other long-haul service to North America and Europe. MRO service provider SR Technics has entered into an exclusive long-term agreement for Integrated Component Services with HK Express, a low-cost airline based in Hong Kong that provides services to countries across Asia Pacific. The agreement covers the carrier’s growing A320 fleet. The 10-year contract covers component maintenance, pool access and logistical services for 20 Airbus A320ceo and 12 Airbus A320neo aircraft. In addition to providing support from its existing component distribution center in Kuala Lumpur, SR Technics will be establishing an Airbus A320 component pool in Hong Kong as part of the agreement. This strengthens its foothold as an ICS provider on the competitive Chinese market and places SR Technics in a solid position to attract other operators across the region. Honeywell has reported financial results for the first quarter of 2018. The company reported a very strong start to 2018 with sales for the first quarter up 9% on a reported basis and up 5% on an organic basis. (The difference between reported and organic sales primarily relates to the impact of foreign currency translation). Aerospace sales for the first quarter were up 8% on an organic basis driven by growth in commercial OE and U.S. defense and strength in light vehicle gas and commercial vehicle turbochargers in Transportation Systems. Segment margin expanded 10 bps to 22.5%, with benefits from commercial excellence, productivity, and lower customer incentives partially offset by higher volumes of lower-margin OE shipments, inflation, and foreign exchange. “As a result of our strong first-quarter performance, the healthy demand environment, and our continued confidence in our ability to execute, we are raising our full-year organic sales guidance to a new range of 3% to 5% and our earnings per share guidance to a new range of US$7.85 to US$8.05. We are also raising our free cash flow guidance by US$0.1bn after a strong first quarter,” said Darius Adamczyk, President and Chief Executive Officer of Honeywell. Drukair, the flag carrier of the Eastern Himalayan Kingdom of Bhutan, has signed a purchase agreement for one Airbus A320neo to support its growth plans and complement its existing fleet of three A319s. The aircraft will be powered by CFM LEAP-1A26E1 engines optimised for high-altitude operations and will become the largest aircraft operating out of Drukair’s base in Paro. Paro, located at an altitude of 7,300 feet and surrounded by high mountains, is one of the world’s most challenging airports. Thanks to the A320neo’s unmatched performance, it will become the largest aircraft to operate from Paro offering greater payload capabilities and higher passenger comfort levels than any other product. AeroVision International (Muskegon, Michigan) has welcomed the addition of Thomas Otto to its Engine Sales Team. Otto will operate out of the U.K. and will be responsible for the procurement, sales, exchange and leasing of all AeroVision engine programs as well as developing new products and markets. Otto started his aviation career in the early 90s as an Aircraft Engine Engineer at MTU BerlinBrandenburg GmbH in Berlin, Germany. He has over 25 years extensive engineering experience including worldwide Field Service. Boeing has delivered the first 737-800 Boeing Converted Freighter (BCF). The first customer is GE Capital Aviation Services (GECAS) and the freighter will be operated by West Atlantic Group, based in Sweden. West Atlantic will receive four 737-800 aircraft within the next 11 months and, once delivered, the company will operate 23 Boeing 737 freighter aircraft. Boeing’s Current Market Outlook forecasts that over the next 20 years, customers will need more than 1,100 standard-body converted freighters. For the 737-800BCF, Boeing has received 45 orders and commitments, from seven customers including: YTO Airlines, based in Hangzhou, China; China Postal Airlines, based in Beijing, China; GECAS, based in Ireland; Air Algerie, based in Algiers, Algeria; LAS Cargo, based in Bogota, Colombia; Cargo Air, based in Sophia, Bulgaria and an unannounced customer. West Star Aviation has appointed Pete McKernan as Senior Vice President of Parts and Component Repair. Pete will be responsible for overseeing West Star Aviation landing gear and accessory departments along with their affiliates, Avant and DAS. Pete has over 35 years of aviation experience working at Cessna/Textron holding various roles including Business Leader for ProAdvantage programs, Director of Aftermarket Finance and Vice President, Parts and Programs. During his time at Cessna/Textron he was responsible for leading organizations in sales, distribution, warranty administration, pricing and supplier management. Helisota – an international provider of integrated maintenance, repair and overhaul (MRO), training services for rotorcraft aviation, has signed a cooperation agreement with ASA – Airline Software Applications ApS regarding the promotion of IT solution for CAMOs and MROs. “We are happy to announce that ASA joins Helisota as a partner. ASA is the expert of world-wide promotion of SAM 11 – the fully functional software solution that enables CAMOs and MROs to certify, maintain, repair and service aircraft and components. The cooperation between the two companies ensures better solutions at promoting services and this is a great opportunity to expand the companies’ market globally,” comments Vita Buragiene, Regional Sales Director at Helisota.